For a child, coming to hospital can be a daunting experience, but the staff at Alder Hey Children’s Hospital ensure they are made to feel welcome and work hard to build friendships with their young patients. Thousands of children and young people are treated within the Cardiac Unit at Alder Hey each year and for many, their treatment involves making a trip to the Cardiac ECHO Rooms where a technician will check to see how their heart is doing via a monitor. Although patients are always greeted by a smile, the two ECHO rooms didn’t always match up to the warm welcome with their ageing décor. 4D Immersive were approached to give these spaces a new lease of life and use our immersive person centred approaches to improve the well-being and comfort of patients. 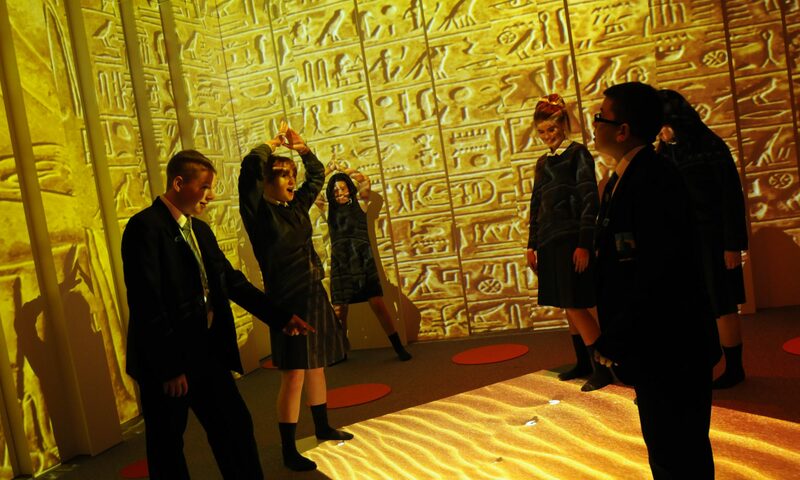 The 4D team had two spaces to work on during the installation of the immersive spaces. The two rooms were heavily used spaces that needed some refurbishment and were also often in use. It created a unique challenge for our team who worked over night during he installation to limit any impact on the hospital and their patients. 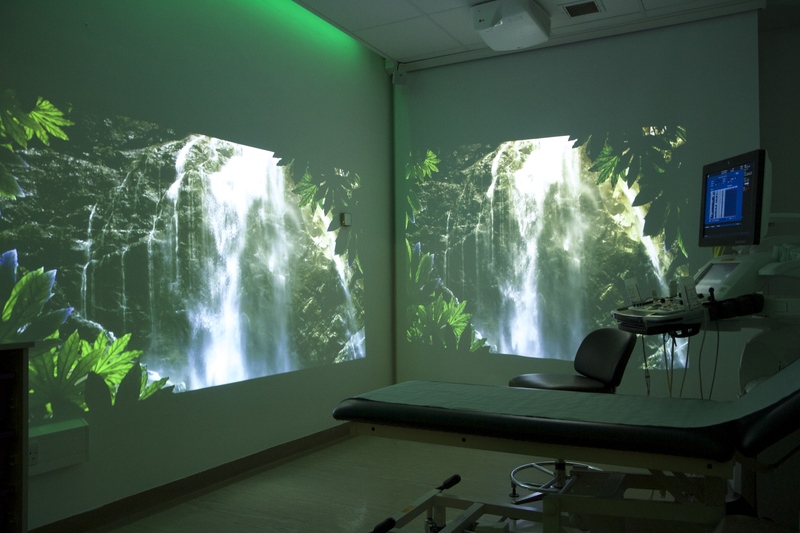 In each ECHO room, our team installed two walls of projection – one large area in front of the patient and one to the side. Pelmet lighting surrounded the room to colour wash the walls with a high quality sound system installed too. Staff at Alder Hey kindly sent over this following feedback – many thanks to Andrea Duggan and Sue Kelly at the hospital. 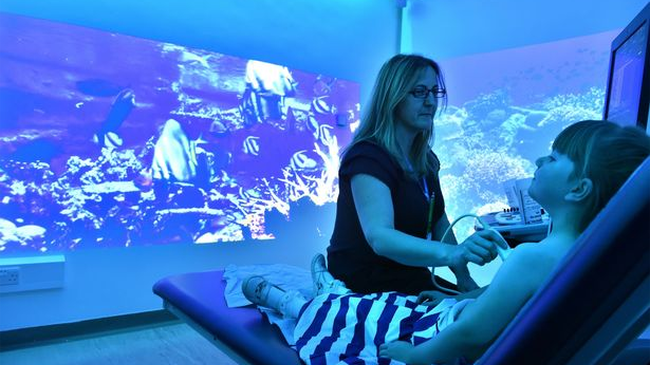 “Last October, Alder Hey were delighted to welcome a unique immersive projection system within the ECHO rooms. The new system was installed by 4D Immersive and projects images on the walls within the treatment walls. This was made possible thanks to a very generous donation from the Thomas Cook Children’s Charity. Fourteen year old Maxwell has been coming to Alder Hey since he was a baby. He is more than familiar with the cardiac ECHO rooms although this time he looks pleasantly surprised as he enters and notices the new addition to the walls. Sharon Clark, Senior Technician is already seeing the benefits of the equipment and says: “The appointments last as long as it takes for the team to obtain a clear image of our young patients’ hearts so if they’re nervous or uncomfortable they may be restless and understandably may be in the treatment room longer. With this piece of equipment, it’s allowing our young patients to focus on what is on the walls and before they know it the appointment is over. “I believe the new installation has transformed the service we provide. Patients of all ages are reaping the benefits; even little babies seem mesmerised by the moving images which in turn is making the parents feels more at ease. The large number of clips and backgrounds available for the children to choose from allows their different needs to be catered for. “We were looking after a young boy who hadn’t been able to have a scan yet as he was extremely distressed. We found out that he loved the emergency services and so the team uploaded some footage of fire engines and ambulances and he was glued to the screen. He went from being very anxious to engrossed to the screens around him. This piece of technology enabled him to undergo his first scan and helped change his experience at hospital forever. With the door open, young Enfys is watching the screens from the waiting area. When asked if she wants to take a closer look she eagerly comes in and sets about choosing her background.